Today Owl Moon is celebrating the one year anniversary of the arrival of “Zen,” the Barred Owl featured on the February page of the 2013 Owl Moon Raptor Center calendar. Zen was hit by a car on the I-70 off-ramp in Mount Airy, MD on February 27, 2012. Wes rescued him on his way to work and transported him to Owl Moon. Today we are celebrating because on Monday, just two days before his anniversary, Zen returned home. He is finally flying free again! Zen soon after he was admitted to Owl Moon Raptor Center. Photograph by Suzanne Shoemaker. Zen’s rehabilitation was prolonged and for much of that time we were guarded on his prognosis for a return to the wild. His left elbow was fractured, and the resulting callus reduced range of motion in that joint. We began physical therapy early, and continued even after it appeared that his flight was impaired and release was unlikely. In hindsight, we could not give him a fair flight assessment due to feather damage. Convinced that Zen was not a release candidate, we found him a permanent home as an education ambassador at Meadowside Nature Center in Rockville, MD. Before he could be placed however, Zen went through a molt which replaced his damaged feathers. With time, Zen’s flight improved. We continued to exercise and recondition him. By November his flight had improved so much that we were convinced he could survive the rigors of life in the wild. While we love nothing more than returning the birds to the wild, it is still a bittersweet moment. When we work with a bird as long as we have Zen. We can’t help but get to know them as individuals, and grow attached. Zen is a boisterous, irrepressible soul. 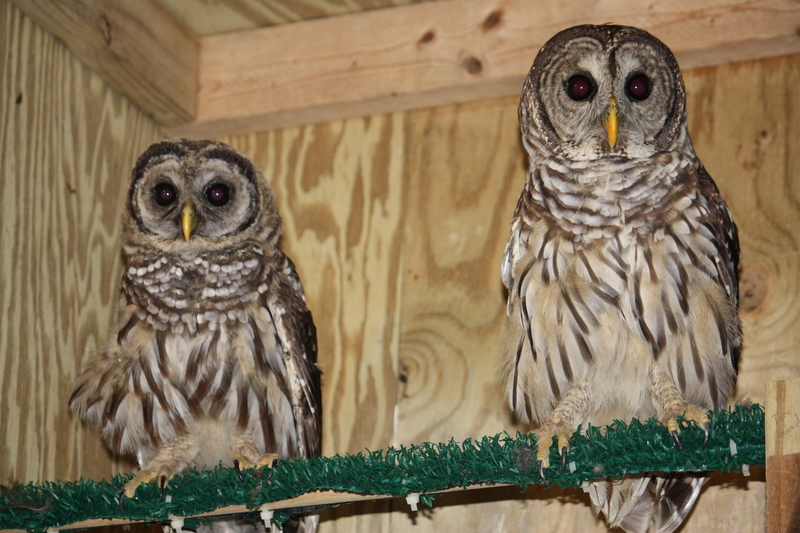 He served as a foster dad for “Little Bear,” an orphaned fledgling Barred owl, and a lively companion for “Lucy”, a female Barred Owl also a victim of a car collision. He was fun to work with and we will miss him. It can be difficult to trust nature to take care of those we’ve grown to love, but because of his indomitable spirit, we know Zen is where he needs to be. We wish him a full and satisfying life, and hope he will raise lots of little Zens. Monday was a beautiful day here, made even more beautiful by witness of Zen’s release. Fortunately, my daughter Natasha was present. Using a video camera borrowed from her friend, David (thank you! ), she was able to capture the happy occasion to share with all of you. Enjoy! The Owl Moon 2014 Calendar is Here! Thank you for sharing Zen’s story, and beautiful photo’s. Congratulations to him, and to you on his recovery! Thank you again for all that you did for Zen. It was so incredible to see him fly away. Him pausing and looking back from the first landing is pretty sweet. I’m sure, his little thank you to you. I was trying to make it out there this week but it looks like it may have to be next week. Thanks again Suzanne, my hats off to you. Hi Wes! I am grateful to you for picking Zen up off the road and bringing him to Owl Moon. As I said on my FB page, I can’t do my work without people like you, who care enough to stop what they are doing and go out of their way to rescue wild animals in need. If you hadn’t done your part, Zen would likely have suffered and died, another victim of the hazards we humans create for wildlife. It takes a village… THANK YOU!! PS. I will be away next week, going to the 2013 National Wildlife Rehabilitators Association Symposium in Portland, OR, where I always learn new tricks and get pumped up for another busy season! Can you come the following week? I look forward to seeing you. Happy to hear of your successful re-hab with Zen. Good job. Thanks, Ken! I wish we could have done the same for Sterling. But another upside of Zen’s recovery, is that Sterling now has a good home at Meadowside Nature Center. I will tell his story in my next update. He moved there last week, and I know they will treat him well. The staff would welcome you to visit him there. In fact, I would like to go too! I want to visit, “Duke”, a Red-tailed Hawk, along with Sterling. Of course, you are still welcome to visit us here, as well. Such a beautiful story of Zen. I enjoyed the videos so much! His second chance is all a product of your dedication, Suzanne! Also, Sterling is doing great so far at Meadowside with his training – already starred in his first program! Thanks for the update, Lisa! 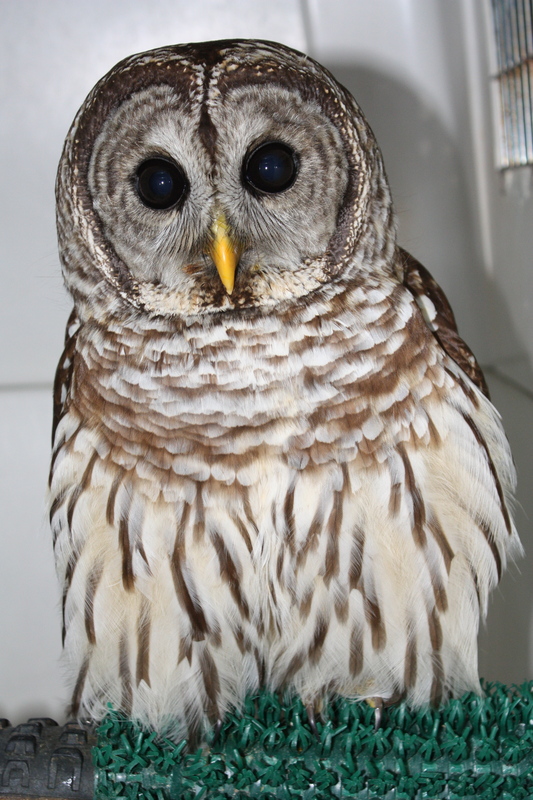 So glad to hear that Sterling is coming along in his training and has already served in his new role as ambassador for wild Barred Owls everywhere. He is such a calm bird, I know he will grow into his new job very nicely. Congratulations and best of luck to you and Sterling! Pingback: Teton Valley Real Estate, Idaho, Driggs Victor Tetonia, Alta » Recovery and Release of “Zen” the Barred Owl. with many more releases. Lee P.
Thank you, Lee!You describe the feelings we have at the release of our charges beautifully. I wish you could have been there to see Zen fly free! You, at the other end of the creance line on numerous occasions, were key to making it happen. I look forward to working with you on the next one, and the one after that, … You are the best. Another win! Good job, Suzanne and Natasha!